Come and learn how to make popular Thai dishes at our Thai Cookery School in Chiang Mai. Chiang Mai has some of the most reasonably priced cookery courses. 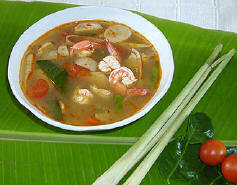 At only 1000Bt/day we will teach you how to make 5 popular Thai dishes. 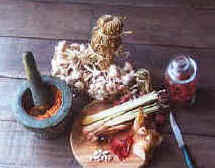 You will also learn about Thai ingredients, rice preparation and Thai fruits or desserts. Our well trained staff will take you through the steps of cooking each dish and you eat all the results. Come and learn a new skill in Chiang Mai; learn the art of Thai cookery. 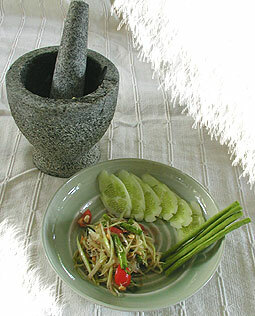 At The Green Mango Cookery School we will teach you about the ingredients, methods and secrets of Thai cookery. 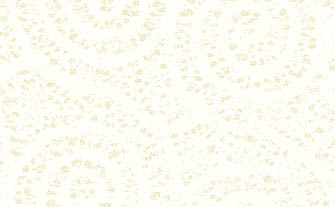 Impress your friends and family when you return home, with your newly learned skills. A traditional Thai atmosphere in suburban Chiang Mai. 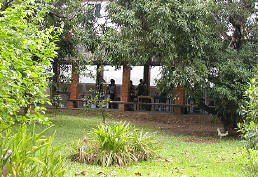 Classes are held at Green Mango Cookery School on the outskirts of town. Copyright © 1998-2015 Sarah Guesthouse All rights reserved.